Dichroa febrifuga is from China and southeast Asia, and, in its native habitat, flowers between June and October. With me, it flowers between November and February. This photo was taken on Christmas day. It is supposed to have beautiful blue berries, but not, so far, for me. When I was given it, I was told it was a hydrangea, to which family it belongs, but in a different genus, dichroa. 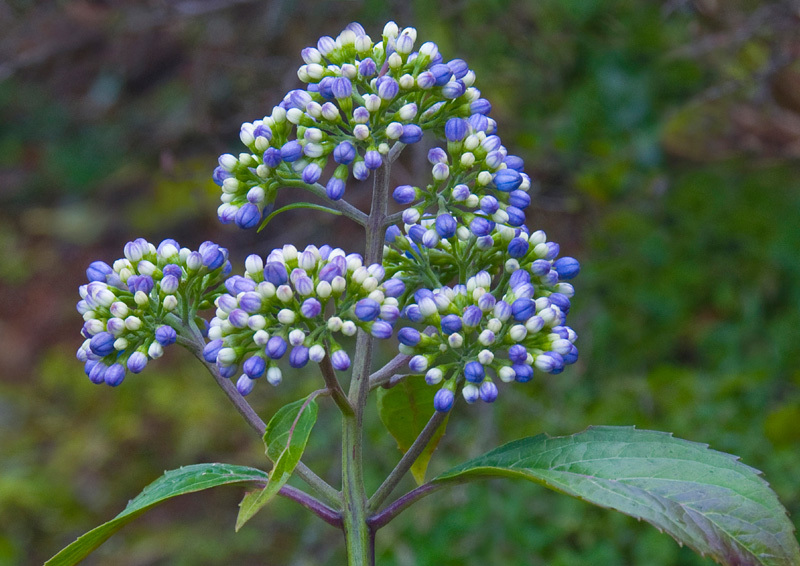 It is commonly known as blue evergreen hydrangea. It was 3 years before it flowered. It is not supposed to be hardy, but I have had it 10 years now. It survived the bad winters, but not unscathed, being reduced to a single stem after the winter of 2010.